1. Output Folder: - You can change the path of output folder by clicking "Browse" button. 2. Format: You can format of the exported file to XLSX, XLS, CSV or SQL Server. 3. 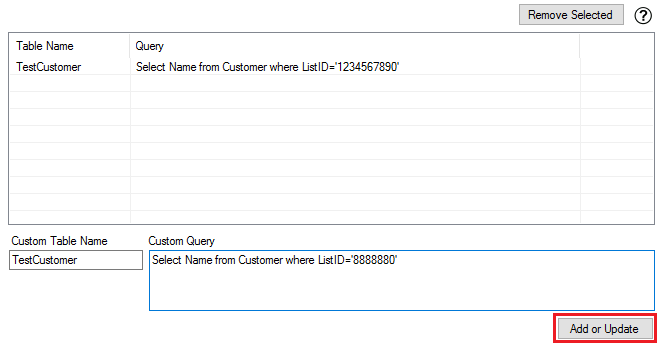 SQL / ODBC Connection String: - You can set SQL / ODBC Connection String. 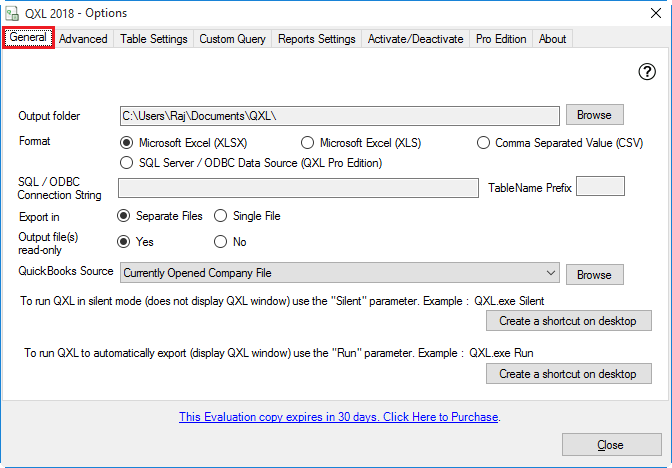 Note: QXL Professional Edition license requires for exporting data into SQL Server / ODBC Data Source. 4. Export In: - You can change the export option to Separate File or Single File. 5. Output file(s) read-only: - You can protect exported file for unwanted write. This option will set exported files to read only if you select "Yes". 6. QuickBooks Source: - You can set up QuickBooks company file path using "Browse" button in QXL OR You can use Currently Opened Company File. When you turn on the Optimizer, QXL will bring some data to a local cache file (the optimizer file) to increase retrieval performance for queries. 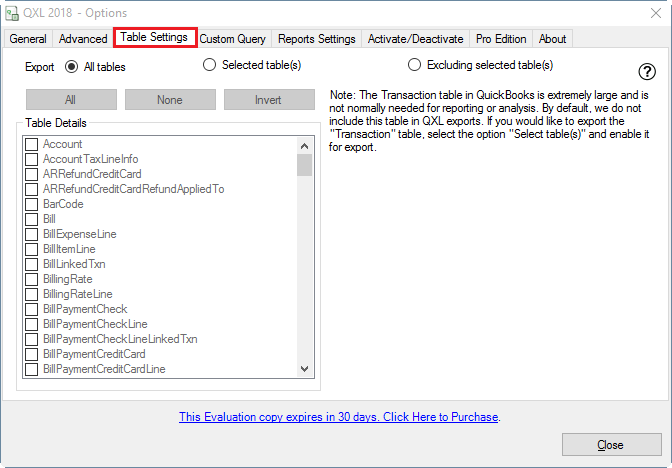 When you access any table, QXL will gather data from QuickBooks and will store it in Optimizer file. 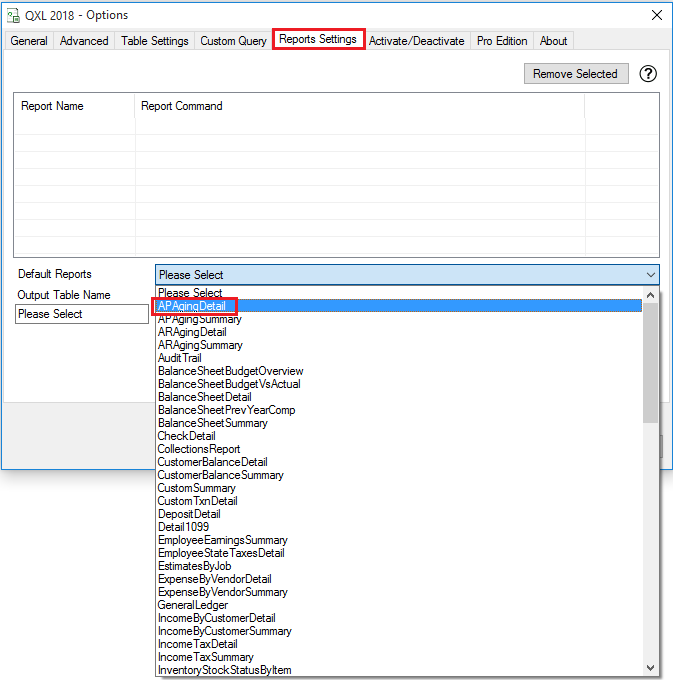 Next time when you query the same table, QXL will request differential records which are added, modified and deleted from QuickBooks and will sync it to Optimizer file. This way QXL will have to only get the differential records instead of entire data set from QuickBooks. As a result, you will notice performance gain when compared to working without Optimizer. Initial optimization of data has been benchmarked at up to a 30% reduction in load time. 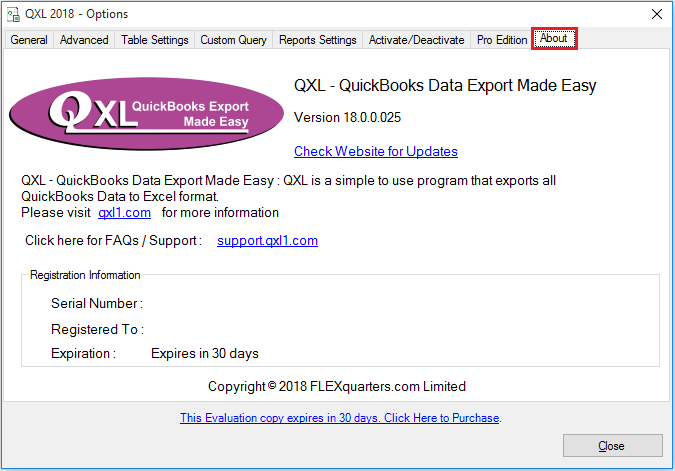 The first time you access a given QuickBooks table, QXL by default optimizes access to that data, so the next time you need data from that table and it will be much faster. Optimizer Database Folder specifies where the local data store will be saved on disk. 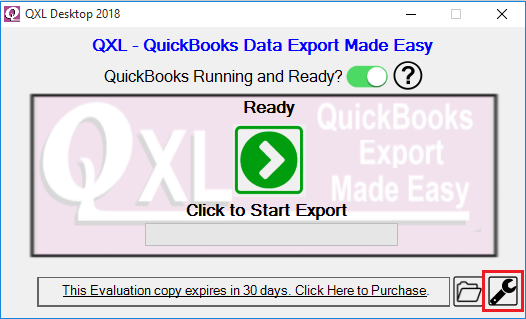 The default location %AppData%\QXL - QuickBooks Data Export Data Made Easy\Optimizer is under your Windows login account name under your Documents and Settings folder. The data will be stored in a file in this folder with a name similar to the company file name with a .opt extension. If you store that data somewhere other than the default click the browse button and select the destination folder. With very large company files we suggest running synchronization after hours. You can change the path of Optimizer folder by clicking "Browse" button. Reset Optimizer File(s): This button is used to completely rebuild the optimized data from scratch. It is useful when you start with a new company if you do not want to synchronize the tables as you first encounter them and make sure that your data is 100% current. Messages allow you to review message logs from QXL regarding errors and issues communicating with QuickBooks, clear these messages, and review messages produced by the QuickBooks qbXML SDK interface. Display Driver Status Panel when selected shows exactly what QXL is doing when accessing the QuickBooks data and provides a good assessment of speed using optimized data and non-optimized data. Table Styles option used for formatting Excel cell by choosing predefined styles (for Excel 2010 or above in [xlsx] format only.) You can select pre-defined style using the drop-down. 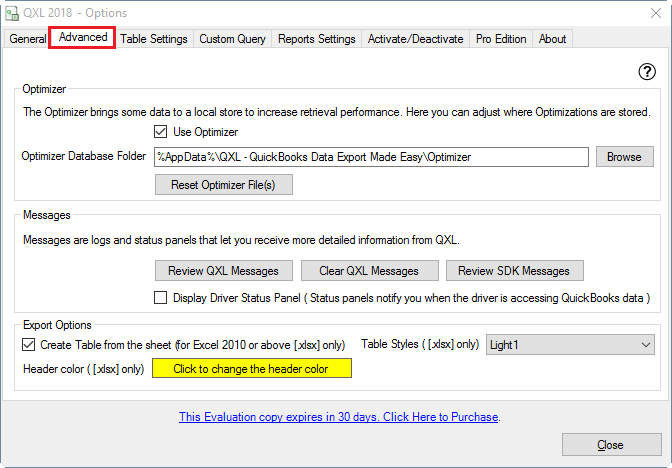 Header Color option used for changing Excel Column Header Color (for Excel 2010 or above in [xlsx] format only.). You can change header color using "Click to change header color" button. 1. ALL Table: - This option will export all tables to the output folder. 2. Selected Table: - This option will export selected tables to the output folder. 3. 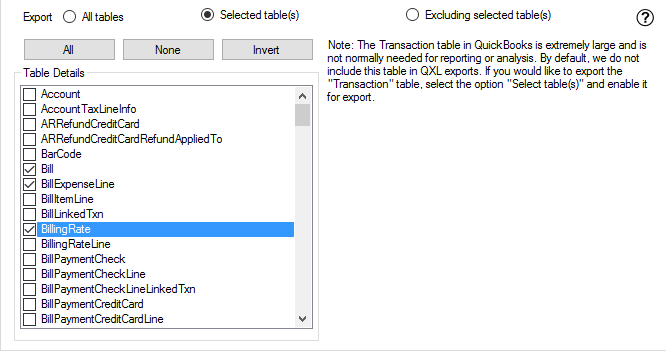 Excluding Selected Table: This option will export all tables to output folder which we have not selected. 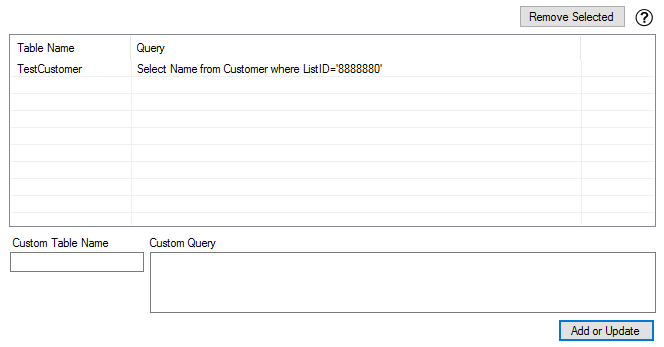 In Selected Table option, you can select the table by double-clicking on the table name. You can select all table by clicking "All". You can clear selection by clicking "None". You can invert table selection by clicking "Invert". You can update existing query by double-clicking on table name & modify query Custom Query box. After changing query click on "Add or Update" button to update query. 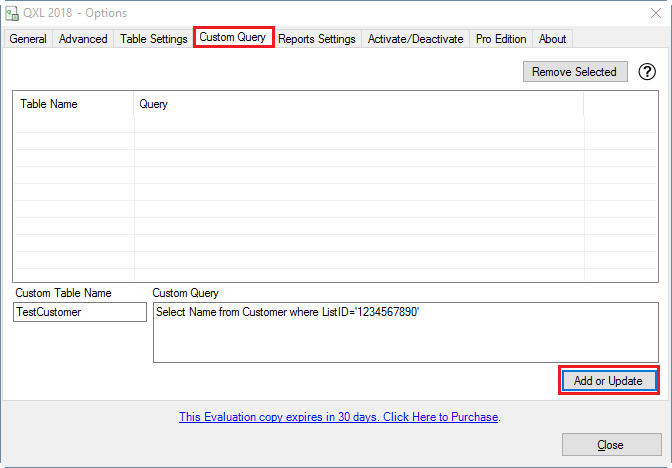 You can remove existing query by double-clicking on table name & click on "Remove Selected" button to delete query. 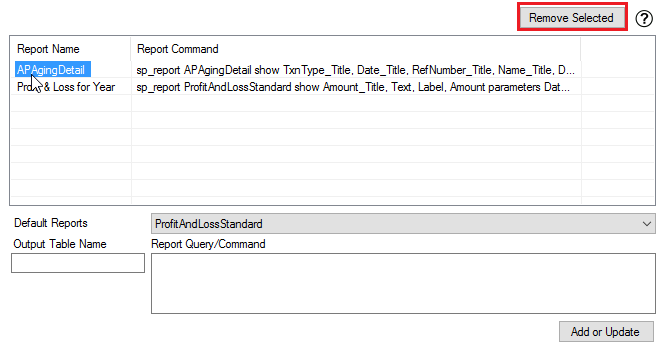 This tab allows you to add default reports to export. 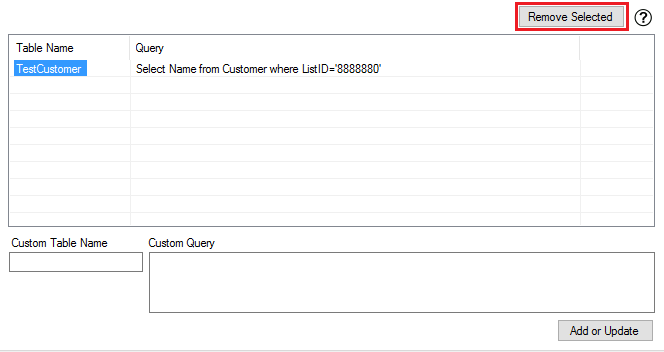 You can also add custom report with different parameters. You can choose default report from the drop-down list & add the report for export. 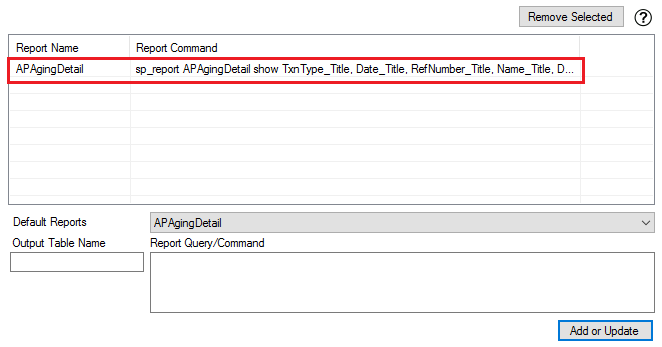 Select any report from the drop-down list & click on "Add or Update" button to add the report for export. 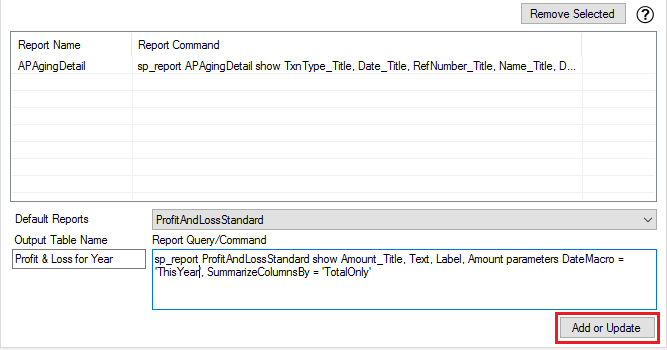 If you want to add Custom report using different parameters, then you can add it by writing report query & output report name. 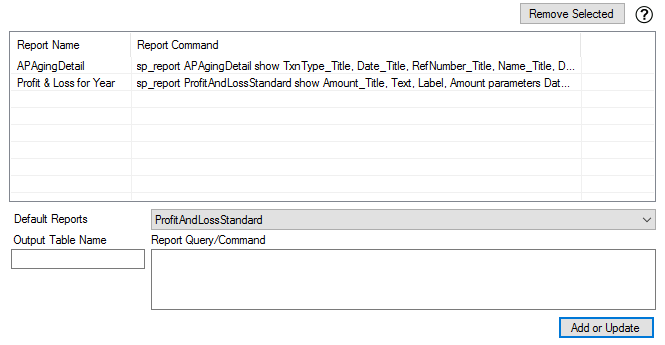 You need to write report name in Output Table Name box & write the query in Report Query/Command box. 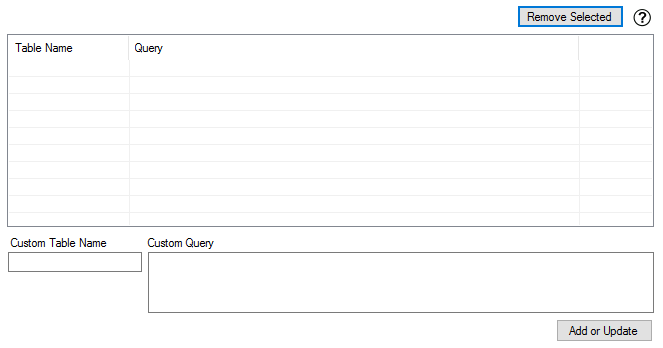 After writing report name & query click on "Add or Update" button to add report query. 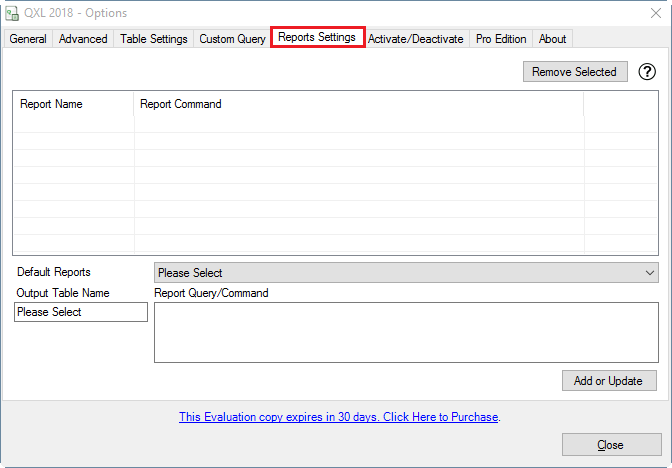 You can remove existing report by double-clicking on report name & click on "Remove Selected" button to delete the report. You can modify existing report by double-clicking on report name. 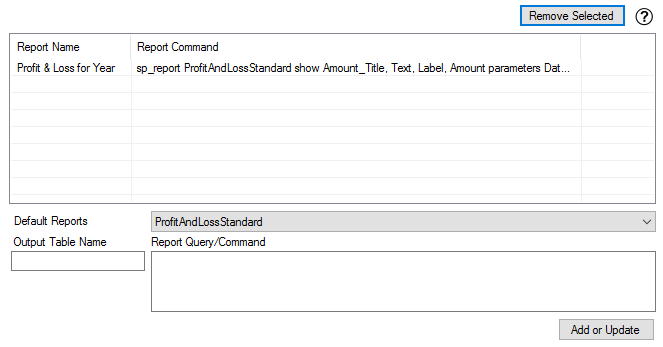 Report name & query/command will be shown in Output Table Name box & Report Query/Command box. 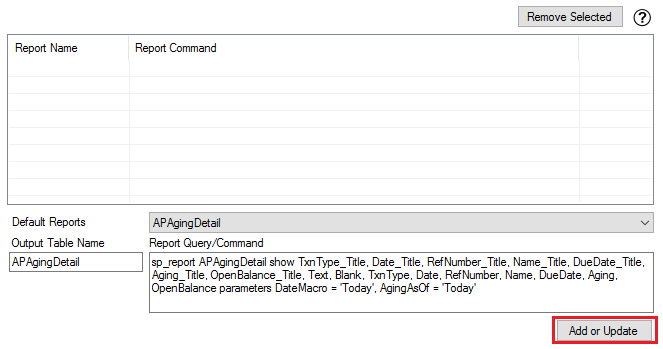 You need to modify report & "Add or Update" button to update report query. You can save all above configuration by clicking "Close" button & you can discard changes by clicking "X" button. 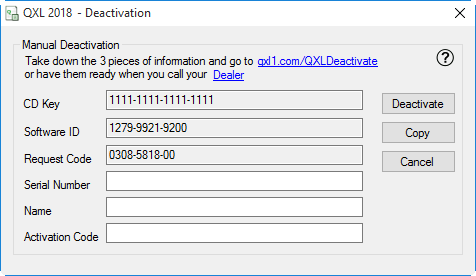 You can Activate / Deactivate QXL by clicking on "Activate / Deactivate" button. 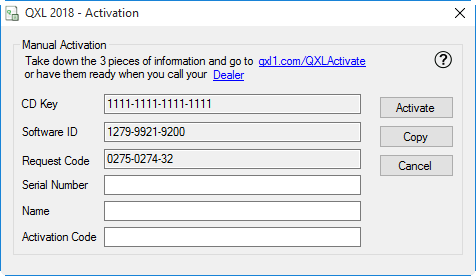 Activate is the online option for entering the CD Key that was issued to you upon purchasing the product to fully activate QXL from the evaluation version to either the full Standard Edition that has been purchased. If you do not have internet access to activate the product from the machine you intend on using it on, you can use the manual option to generate an activation code from a machine that has internet access. Enter CD Key & click on "Activate"
Enter CD Key & click on "Manual"
Deactivate is the online method of deactivating a currently registered version of QXL for the transfer of the product to another machine. This process will take 24 to 48 hours before your CD Key account is credited with the deactivated license and you can reactivate the license on a different machine. If internet access is not available from the registered machine, you can use the manual option to generate a deactivation code from a machine that has internet access. 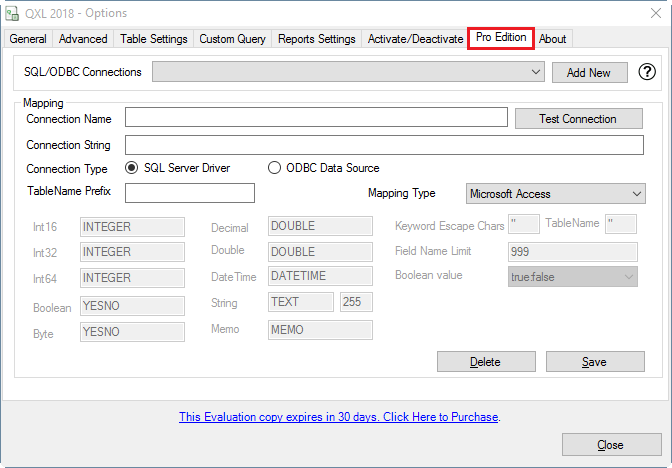 Using Pro Edition Tab you can export QuickBooks Data into SQL Server & ODBC database. Please refer below mentioned link for more details. 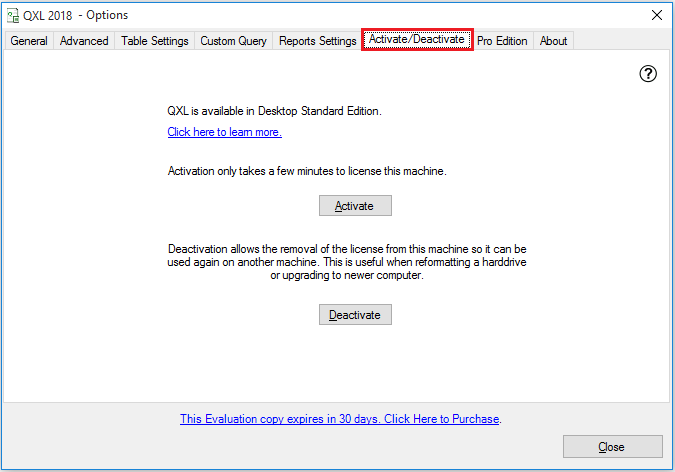 QXL Professional Edition license required to use this feature.